How to adjust the Length of form in Facebook? 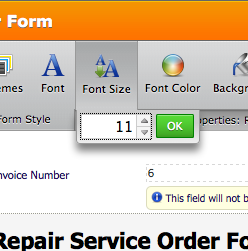 I have adjusted all i know how to do but the bottom of form is cut off. I was wondering how to shrink the Service Items List. Leon, I am deleting the duplicate posts for this question. It looks like the Jotform font setting was overriding the injected CSS. I have dropped the font size by one point for you (from 12 to 11). See what you think and let me know. Yes the expand and shrink is oposite for all my forms. Daniel, Do you know how to secure the form or link to Jots secure Server from Facebook?? Glad it is sorted. I see that you have posted another thread regarding your secure facebook submissions. We'll investigate for you and someone will have an answer for you asap.